We have only have three weeks . . . time’s running out. Time’s always running out, if you really stop to think about it. But who has time to think? And why would you want to ponder your mortality when there are things like mountains and ferries and shoe stores? ← What would you do with $20 and a free afternoon? Ah, Mt. Rainier. My hubby, then 18-month-old daughter and I lived in Tacoma one summer for hubby’s job. We loved it there, loved being able to see Mt. Rainier from in front of our apartment, were in awe of the snow piled up over the visitor’s center there in June. It is a beautiful place – so off you go! 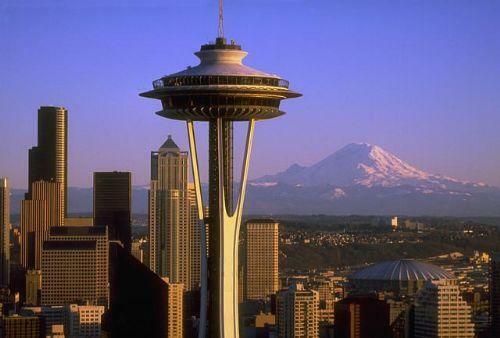 In the ten years I lived near Seattle, I never once went to Mt Rainier. Always wanted to, but never did. Definitely seize the day and go. Your list inspired me, so off I went to THE mountain today. Stopped first at Paradise, then drove around to the other side, and got some awesome photos at Sunrise. In between, however, I took a wrong turn and ended up going 45 minutes in the wrong direction, one way! Oh well – I just pretended I meant to go to Packwood! One of these next few hot days, perhaps I’ll do the Bremerton to Seattle ferry run – Even more fun – – – I won’t need to buy shoes for the kids.